At eleven years old, Jules Moreau loses his parents in a tragic accident, and in an instant, his childhood is shattered. Leaving a comfortable home in Munich and holidays in the south of France far behind, he and his siblings, Marty and Liz, are enrolled in a bleak boarding school, where the trio begin to lose each other, as well as themselves. Marty throws himself into academic life; Liz is drawn to dark forms of escapism; and Jules, though once vivacious and fearless, turns inward, becoming a ghost of his former self...until he meets Alva. Shy, intelligent, and enigmatic, and concealing a dark childhood of her own, Alva pulls Jules out of his shell and the two bond over books and writing, always with an unspoken understanding of the other's pain. Eight years later, at the precipice of their friendship becoming more, Alva abruptly turns her back, and the two leave school on separate paths. As they enter adulthood, Jules, Marty, and Liz, still strangers to one another, struggle to contend with who they are becoming. Jules is adrift, growing into a directionless young man, anchored only tenuously by two desires: to be a writer, and to have Alva back in his life. It isn't until Liz hits rock bottom that the three siblings finally find their footing as a family, and Jules finds the nerve to reach out to Alva -- fifteen years after they last spoke. Invited by Alva to join her and her husband, an esteemed author, at their home in Switzerland, Jules finds his way back to his own writing, and to his closest friend. As life begins to fall into place, just as it seems that they can make amends for time wasted, the past catches up with them, and fate -- or chance -- once again intervenes. 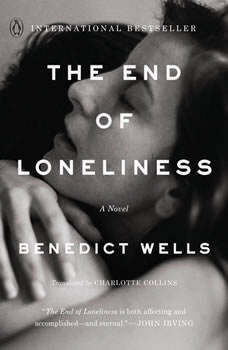 A kaleidoscopic and heartfelt family saga, as well as a deeply felt meditation on the power of memory, The End of Loneliness explores the invisible forces and currents that can change our lives in an instant, and asks us all to consider, If you spend all your life running in the wrong direction, could it be the right one after all?